Summary: How much does a new bathroom cost, average bathroom installation costs and average bathroom fixture costs. The cost of fitting a bathroom is, in part, determined by your budget. There is so much variability in costs of fixtures and fittings, as well as the size and the current condition of the bathroom being a determining factor. New bathroom suites can range from the very basic to the very latest in technology driven comfort so what you can achieve is determined more by your own budget and desires. When considering how much it will cost it's not only the cost of the bath and other fittings that have to be considered but also the associated plumbing work and any redecoration. Again this can range from simply replacing a suite in the existing positions where the plumbing work will be minimal, right through to creating a new space with perhaps a state of the art wet room. 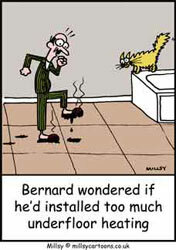 In this case, the plumbing work is likely to be of a more complicated nature and consequently more costly. It's important to consider how much work needs to be done to prepare the room for its new look and whether this can be a DIY project. The more help you need to buy-in, the more costly the project will become. If budget is an issue and you lack some skills, it could be a case of working out which tasks need an expert, such as the actual plumbing and which are low skill, such as removing tiles or old cupboards. Specialist bathroom companies will handle the whole project for you but this will come at a cost. Some plumbers are also willing to do additional work such as tiling, but you may have to get separate tradesmen for different jobs. So make sure you think through your entire project when working out costs. Who will do the plumbing, tiling, decorating and so on? If budget is an issue and you lack some DIY skills, it could be a case of working out which tasks need an expert. Costs vary hugely for the same job depending on the size of firm, locality and area you live in. Always make sure you get a number of quotes and ensure you know exactly what's included in each quote. Some firms supply and fit their own bathroom suites whereas an independent plumber will fit a bathroom you have sourced yourself from a DIY store. Sometimes independent plumbers may be able to source products for you at trade price. Plain white suites can be bought from DIY stores to take away for as little as £300 including taps, but you can pay more than this for a bath alone if you are looking for something more individual. A little like kitchens, bathrooms require lots of extras that need to be taken into account when calculating costs. With a sink you need to buy taps and a waste and showers require a tray and enclosure, as well as the shower itself. Other items you may want to consider are new radiators - in particular heated towel rails can be a bonus in a bathroom. Extra items like this will also need installing, so make sure your fitter is aware of this. Aside from the new bathroom suite, you will probably have to consider the décor and this can add considerable cost if the room is to be fully tiled for example. The size of the room is a major factor and whether the tiling is to include the floor and walls or only parts of these. Bathrooms can of course be painted in appropriate paint and this can be a cheaper option for the budget conscious. Tiles can add a real luxury feel to the room and this may be an area where you want to be extravagant. Tiling is quite a skilled job so the cost of putting up the tiles will need to be added in. Tilers usually price at so much per square metre, so the room size is key to cost. Storage space in a bathroom can be at a premium and many companies now offer bathroom furniture into which the suite can be fitted. This provides essential storage space for all your bathroom bits and pieces and can ensure a small room feels more spacious. Last but not least are the finishing touches to the new room. Are you buying new towels and blinds for example? Mirrors in particular can be a big feature to a bathroom and range from under £100 to much more. The way to cost a bathroom is to think about how you see the finished space and take account from there of everything you will need to achieve it. See where you need tradesmen and where your DIY skills will suffice and then choose to shop in a store which meets both your style requirements and available budget. Sometimes independent plumbers may be able to source products for you at trade price. Mirrors in particular can be a big feature to a bathroom and range from under £100 to much more.